Parkinson's Disease: Is Walking a Potential Treatment? The form of exercise I always recommend to those just starting to get into exercising regularly or those with limited mobility is walking. Walking is one of the easiest forms of exercise. 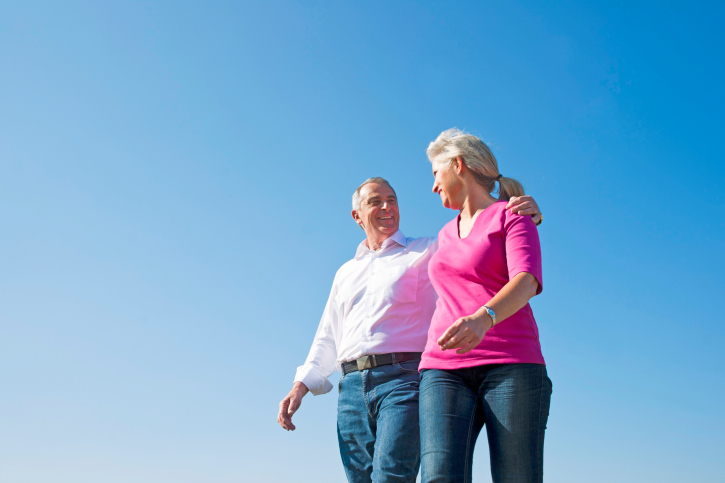 There’s even evidence that walking can cure a number of health issues, such as diabetes. Now a new study has me believing even more in this simple form of exercise. Turns out, going for a brisk walk may also be beneficial for patients with Parkinson’s disease. The study from the University of Iowa and the Veterans Affairs Medical Center of Iowa City found that for Parkinson’s patients who were still mobile, walking three times a week showed a marked improvement in symptoms, with less depression and fatigue. Best of all, this is an affordable treatment. Parkinson’s causes a loss of brain cells that produce the neurotransmitter that is important for movement. Symptoms are usually barely perceptible at first, like a minor tremor in the limbs, but this will progress to difficulty walking and talking over time. This loss of mobility often leads to depression in many patients. Sadly, there is no cure for Parkinson’s disease. But as this study shows, we can slow its progression. Let me explain this study in a little more detail. To begin, researchers at the University of Iowa recruited a group of 60 Parkinson’s patients with mild to moderate symptoms and ran a variety of tests to ensure that they were walking at a moderate pace—enough to raise their heart rates, but not by too much. The participants walked for 25 minutes at an average speed of 2.9 miles an hour. This pace raised their heart rates to an average of 47% of its maximum capacity. They repeated this exercise regularly over the course of six months—but there were some minor differences that took place during this time. The study was divided into two stages. The first stage divided participants into two groups. Half of the subjects alternated between slow and fast walking, switching speeds every three minutes. Meanwhile, the other half walked at a continuous pace. New subjects were assigned to the continuous speed group when knee pain became a problem for the interval speed group. Knee pain was not a problem for the continuous speed group. During this stage, the study observed aerobic function, participants’ level of fatigue, their motor function, and their quality of life. During the second stage of the study, the subjects showed a marked improvement in aerobic fitness and were walking at a faster pace with better balance. Additionally, they experienced less muscle stiffness. The researchers hope that there will be a third stage to the study since the results were encouraging. While the study prescribes walking as an effective, but supplemental treatment to what a patient’s doctor prescribes, I would also recommend this form of exercise as a possible preventative treatment. Sure, walking hasn’t been proven to prevent Parkinson’s—just slow its progression—but it doesn’t hurt to make it part of your daily routine, especially when it is known to help prevent so many other diseases. So why not start today with a couple laps around the neighborhood or a walk to the corner store for milk instead of driving. Taking these little steps could prove to be a big step in keeping your good health. “Brisk Walking May Help Curb Parkinson’s Symptoms,” MedlinePlus web site, July 2, 2014; http://www.nlm.nih.gov/medlineplus/news/fullstory_147117.html. Doyle, K., “Walking may ease Parkinson’s symptoms study suggests,” Reuters, July 2, 2014; http://www.reuters.com/article/2014/07/02/us-parkinsons-walking-idUSKBN0F72D520140702. Fox, M., “Walking works more magic – This time in Parkinson’s,” Today Health web site, July 2, 2014; http://www.today.com/health/walking-works-more-magic-time-parkinsons-1D79878605.